We all have had an experience with coincidences, whether we know how they happen or not, they still have an effect on us. Right now there is a controversy about whether or not a coincidence is due to chance and luck or if it is an act of God. Normally when we experience a coincidence we never really think that it is God trying to tell us something. We just believe that what we experienced is due to luck and nothing else. Coincidence is defined as “a striking occurrence of two or more events at one time apparently by mire chance”. Sometimes certain events are really easy to explain as to why they occurred but sometimes it is hard to say that no extraordinary measures occurred to make whatever happened happen. According to this article, Frederick Hosteler says that sometimes even when we think we know something to be true, it can be very hard to prove it. This means that we can believe in something so much, that we cannot prove it exists. 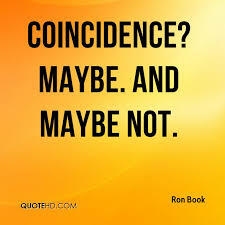 Later in the article Dr. Bernard D. Beitman talks about how coincidence has to do with psychology as well. He talks about how coincidences have to do with our recognition and recall of certain events, and how we like to search for patterns in our every day lives. Looking for patterns is the way that we choose to explain what we cannot. It gives us the answers we are looking for whether they are write or not. Because the matter is so subjective it is hard to get any type of science connected to it. With out scientific explanation, it is easier for us to blame a higher power for what we have experienced. My personal belief is that there are some things that are due to chance and luck but sometimes there are things that we cannot explain so we need to believe in a higher power. What is interesting is that, according to this article, the word coincidence comes from the greek work synkyrian, meaning what occurs when God intervenes in our lives. Just like many people have said before, God works in mysterious ways and sometimes he will purposely put something in front of your face to get you to notice it. When it comes to the science and coincidences, this article talks about how chance and coincidence do not exist, and what occurs does not happen by God, it talks about how we are all connected through our unconscious selves. Meaning we are unknowingly connected through our thoughts and ideas. The article also talks about the law of bringing everything together, Synchronicity. Something else we have heard a lot in our lives is in this article as well, and that is it talks about how everything that we do has an effect on our universe, no matter how small. What we do has consequences both good and bad, and that if we believe in something hard enough, it will work out in your favor. As much as we do not want to believe it, many times what we want somehow gets to us. Keeping in mind that science and God are two separate things, coincidences happen and they will continue to influence us. Coincidence? picture is from here. Albert Einstein picture is from here. Coincidence picture is from here. This entry was posted in Uncategorized on October 6, 2016 by Emily Fiacco Tuite. Hi Emily! First off, good article on a very interesting topic! However, I would make sure you email Andrew to ask about the quotes you used in your article if you haven’t yet. I would hate to see you get academic dishonesty for this post. Likewise, I would definitely use Google Scholarly and find some studies related to the topic if you can. Otherwise, your article doesn’t really relate to class and I imagine you’ll get a lower grade on this post. Switching to the post, I personally don’t believe in coincidences. I believe that where you are was where you’ve always meant to be. Without that idea, than life to me is just a big group of chance and coincidences, having no meaning associated with it unless with make it have meaning. Personally, knowing there’s a God or that my life has meaning keeps me pushing myself tobe the best I can be for whatever is right around the corner.